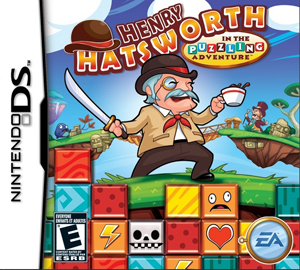 Henry Hatsworth in the Puzzling Adventure is a neat combination of a platformer and a puzzle game. Taking advantage of the DS‘ dual screens, the top screen lets you control Hatsworth through worlds, and on the bottom screen is a Bejeweled-type game; you can get powerups to go into the puzzle in the top world, and use those powerups and get health in the bottom. It’s an entertaining and kind of addictive combination. The gameplay is the most important thing in a game, and that’s where Hatsworth shines; the story and voices, while just window-dressing aren’t great. The main flaw with the voices is that the characters make one annoying noise, and say the noise over and over. The title character makes a “harumph” type noise, the main villain makes a “Nyeaah” type, and the sidekick makes the most irritating of all, an untranscribable high-pitched, nasal whine. The story, of sealing up a monster-world via the collection of device parts, isn’t bad, but at bit cliche — a cliche not made better by the sidekick’s constant commenting about how lame and cliche it is. Luckily, those don’t hinder the game too much — the story’s not what matters in a game like this (and usually they’re equally silly and cliche), and the voice acting can be avoided by turning off the volume whenever dialogue takes place (be sure not to keep it off all the time; the music is very good and catchy!). The controls are easy to use and the levels are fun and have a lot of re-play value, what with lots of hidden bonuses and extra levels to play. The only flaw in the game is that once you beat it, it allows you the opportunity to play in “Gentleman’s Mode”, which lets you go through ALL the levels again (including the tutorial level) with all the tools you picked up while beating the game — but there’s no actual difference to the levels, so you start over playing the game, only it’s now much easier, rather than more difficult. That’s a strange choice, but about the only mistake in terms of the actual gameplay. The Department of Tweed and Trilbies! !